So, when I first read this I thought it was some Canada joke or something, and in a sense, that’s precisely what it is, but nevertheless, this is real life and sometimes things happen that make us “WTF? !” very loudly. That lovable “Complicated” pop star Avril Lavigne is indeed engaged to marry Chad Kroeger, the frontman of infamously hated Canadian rock outfit, Nickelback (Say it in a deep, disgusted voice when you read it. I did.) The pair first came together in February of this year when they started writing a song together for Lavigne’s fifth studio album and a friend of Avril’s states that “A romantic relationship blossomed as they spent time writing together.” Ick. Anyway, Kroeger popped the question to Lavigne on August 8 with a 14 karat blinder and the deal was done. If you remember, Lavigne was married to Deryck Whibley of Sum 41 (which made a hell of a lot more sense than Kroeger) but they divorced in November of 2010. 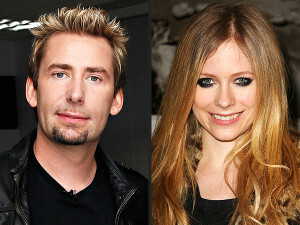 They say opposites attract and if they’re happy then good for them… but Kroeger, really? I mean… Nickelback, ya know? I just picture Kroeger continuously saying, “Look at this photograph” as they go through their wedding album with friends and family.